"After a very popular residency in Soho during late 2013, The Fat Bear team are looking to sink their teeth into new dining projects for 2014. They will be hosting a series of ‘Beefsteak’ events, a staple of New Jersey and New York cow aficionados, on a fortnightly basis from May 25th until July 6th and likely extending later into the year. 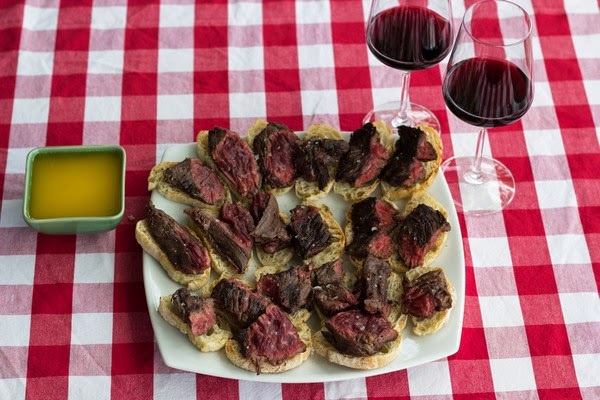 Beefsteaks are extravagant, indulgent affairs which involve mountains of the finest beef sliced and then dipped into butter and eaten with fingers, alongside copious quantities of excellent wine. No crockery, no cutlery, no pretension – just a judgement-free few hours of decadent gastronomy. While The Fat Bear strives to bring some of the undiscovered joys of American regional cuisine to London, this fine city also has its own history of similar events. Organisations such as ‘The Sublime Society of Beef Steaks’ are few and far between, and are confined to a select few members. Now, this slice of British history and North-East American culture is open to all. The Fat Bear will be working alongside the exceptional Rare Breed Meat Co. for their beefy victuals, and the superb Bedales for wines of exemplary quality. The charming environs of the upstairs private dining room at the Rising Sun pub on Carter lane will allow 40 people, seated at communal tables as is traditional, to enjoy a Sunday afternoon of unashamed revelry. Tickets will be £60, which includes unrivalled quantities of both beef and red wine – no additional service charge, entry fees, supplements or ticket handling fees etc."